Fernando Alonso believes he has nothing to lose in the Brazilian Grand Prix as he aims beat Sebastian Vettel to the 2012 Formula 1 championship title. The Ferrari driver arrives at the season finale 13 points behind the Red Bull driver after they finished third and second respectively in the previous race in the United States. Vettel is favourite for the title not only because of his points advantage but because of the pace of his car compared with Alonso's. The Spaniard finished nearly 40 seconds behind Vettel at Austin. Alonso admitted he is not feeling under much pressure this weekend as he is aware that the fate of championship is not in his hands. "It would be good to be on the podium to score a minimum of 15 points and when we cross the line we will see where Seb is and we will try and do the numbers after that," Alonso told a news conference at Interlagos. "The first priority is to be on the podium, which gives us possibility to score more than 13 points, and then we need to wait for the result from Red Bull. "It is not in our hands, we have not much to lose; the only possibility is to win something. If he wins, fine. We try again next year." He added: "There is always pressure but we have less than other occasions and less than leading the championship. We have nothing to lose. "We are arriving in second position and have been qualifying seventh in the last few grands prix so to recover 13 points is quite difficult. If something normal happens we finish second. If something special happens then we win. It is not in our hands really so the pressure is much less." The Ferrari driver conceded his car is unlikely to be closer to the Red Bull in Brazil than it was in America. "There is no magic that you can put in the car in five days," he said. "We were seventh in Abu Dhabi [qualifying], ninth in Austin, so those positions should be normal but hopefully we can do a better job." Alonso, who is fighting with Vettel to become the youngest triple champion in history, is convinced he will have more chances to fight for the title if he loses out this year. "I hope so. I am 31 and I still feel I will have some more possibilities. I am at Ferrari for the next four/five years minimum, so that always gives you the possibility to fight for championships. 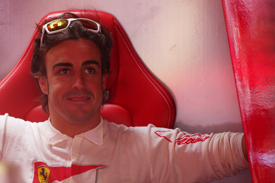 "In three years at Ferrari twice I arrived in the last race fighting for the championship. We were never dominant but even with problems we were fighting two times, so I am sure in next four/five years there will be other opportunities."